The golden age of offshore pirate radio is loving recreated in The Boat That Rocked, the latest comedy from writer-director Richard Curtis. According to the creator of Four Weddings and a Funeral, Love Actually and Notting Hill, it does not matter if his new film enjoys their phenomenal success. When your film credits include some of the most successful British movies in box office history, you could be forgiven for feeling trepidation each time you go back behind the camera. 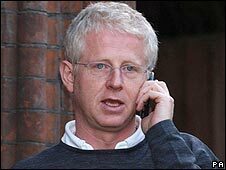 If Richard Curtis is at all concerned how his latest project will fare in cinemas, he is hiding it well. "The honest answer is I don't," he shrugs, when asked if making money is a major priority ahead of his new movie's release. "Making a film is such a long process, the idea that whether, at some point in the distant future, it's going to do well in a weekend is not something that hangs heavy over you." 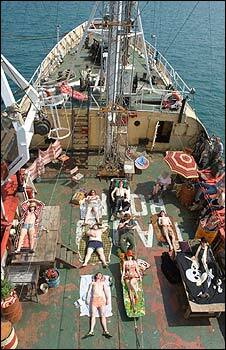 It is fair to say The Boat That Rocked, a comedy about a floating pirate radio station broadcasting illegally in the 1960s, marks a departure for the 52-year-old. For one thing, there is no role for Hugh Grant - the actor who has, almost by default, become his regular leading man. It is also a period piece whose 1960s music and trappings set it apart from the contemporary romantic comedies that have been his trademark. 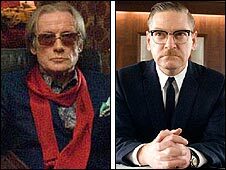 Actor Bill Nighy, however, has no doubt The Boat That Rocked will connect with audiences just as much as Curtis's previous films. "Richard writes about universal themes, he accentuates the positive and he can make you laugh," says the 59-year-old. "I think people are always grateful when he does a movie. They want more of his stuff because the last one made them feel good." Indeed, audiences have embraced his work in such vast numbers that he is arguably the closest the UK film industry has to a one-man hit factory. The critics have not always been so appreciative, taking him to task for his cosy visions of middle-class Britain and his warm-hearted, often sentimental storylines. Having worked with Curtis on three films to date - Love Actually in 2003, 2005's The Girl in the Cafe and now The Boat That Rocked - Nighy sees an element of mean-spiritedness at work. "I should imagine there's a degree of resentment," says the actor. "But I don't read critics and concern myself with what they write. "The world digs it profoundly and they turn up in their millions. The rest is a side issue." In The Boat That Rocked, Bill Nighy plays the boss of a pirate radio station anchored in the North Sea that is awash with eccentric disc jockeys. These include an ex-pat American played by Philip Seymour Hoffman, a lascivious lothario played by Rhys Ifans and a prank-playing clown played by Kiwi comic Rhys Darby, who will remind many of the late Kenny Everett. Having so many colourful characters enabled Curtis to continue his policy - initiated in Love Actually - of assembling a large ensemble cast. "The moment I thought of setting it on a boat, I knew I would have to fill out the whole DJ roster," he explains. "The fringe benefit is it's brilliant casting a movie in the UK because there are so many extraordinary actors." One of them, Kenneth Branagh, makes an eye-catching contribution as a puritanical government minister intent on shutting down 'Radio Rock'. For his part, Curtis considers having the acclaimed Shakespearean actor-director on board an extra feather in his cap. "I thought he was too grand to be in any film of mine, having no rhyming couplets or Nazis in it," he says of Branagh, recently seen alongside Tom Cruise - and Nighy - in World War II thriller Valkyrie. "But Ken realised it would be quite a small amount of time and would enable him to grow one of the many moustaches he hopes to grow over the course of his career." The Boat That Rocked is out in the UK on 1 April.